Two wins, one desperately narrow loss that could have ended differently, ten tries, two ranking places gained and all of the above completed with the absence of a host of players who have proved crucial for Scotland in the past, including the two best props in the country. All in, there was much to admire about Scotland’s autumn series and it was rounded off in some style yesterday in Kilmarnock. There is something about Rugby Park and its plastic pitch that seems to bring out the best in this Scotland squad. They put 37 points past Tonga two years ago and they followed that with an even more comprehensive 43-16 victory over Georgia yesterday. Is it possible, the visiting coach Milton Haig was quizzed, that his team had underestimated the strength of the Scottish forwards who wrestled this game from the visitors’ grasp in a dominant first half? “We know exactly what Scotland are about,” replied the Kiwi. “They are not ranked seventh in the world for nothing. They have just come off very high-level games against Australia, which they should have won, and they beat Argentina. Both teams are in the Rugby Championship. Vern Cotter was clearly a happy man, not that he was about to dance on the table, but the Scotland coach exuded a quiet satisfaction, knowing that this had been a potential banana skin. He also had the satisfaction of having out-thought his former team-mate and friend Haig. Scotland undermined the Georgians’ confidence by successfully attacking them at their strongest point. Admittedly, the Scottish scrum came under occasional pressure – Moray Low receiving a late yellow for repeated infringements – but the Scottish forwards scored a telling blow with a penalty try in the first half that came directly from a driving maul, a tactic the Georgians had tried and notably failed to convert on more than one occasion. Was this, Cotter was quizzed, a deliberate tactic? “We knew it would be a physical game,” replied the coach, “but we thought that that would probably be the best point of access for us, to take them on at their strong points and the players responded well to that. It was something that they were keen to do. This Scotland squad is the strongest since that Championship-winning one of 1999. Several new faces like Allan Dell, Zander Fagerson and Ali Price have all been blooded and there are several big names who should be back to bolster it even further in time for the opener against Ireland in the Six Nations. 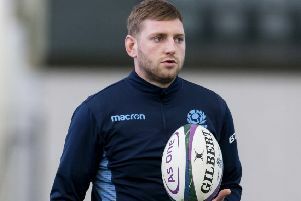 Joe Schmidt’s team may be the toast of the rugby world after halting the All Blacks’ unbeaten run but Scotland can go into that opening game with more confidence than they have had for many a long year. “The positivity is important,” said Cotter, “and competition for spots is important. We will see who is available at the end of January but, I agree, on competition for spots we’re looking at centre position. We didn’t have Duncan Taylor for this series and he’s been an important player for this team.